You may think you're ready for those pain medications as soon as you check-in to the hospital, but that is not the case. You may have to wait around awhile before you can ease that pain and settle in to labor land. The three main choices for pain relief during labor are traditional pain medications, epidural and spinal. Traditional Pain Medications: These can be given at any time after admittance to the hospital. The doctor will choose a safe medication that will not harm baby. Pain medications are often paired with a sedative if you're feeling nervous or nauseous. Epidural: The epidural can be given at any time during early to mid-labor, but don't wait too long. The epidural takes 10 to 20 minutes to start working with the full effect taking up to an hour in some cases. 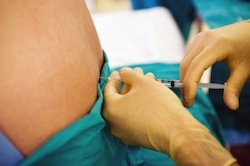 Despite some information otherwise, epidurals may be allowed in some hospital settings well into the pushing phase as long as the baby has not crowned.